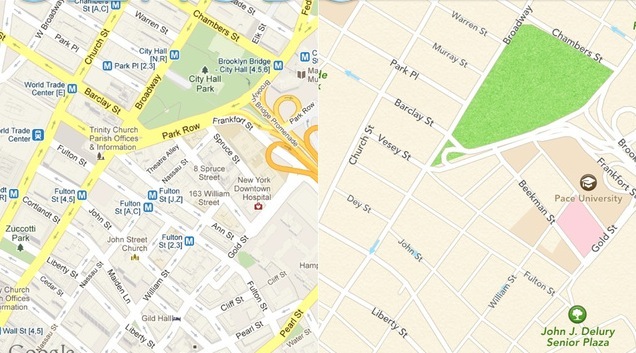 This Is The One Thing Apple Maps Does Better Than Google Maps | OhGizmo! Our data experts performed an identical series of activities on Google Maps and Apple Maps that included searching for several US cities, addresses and airports and zooming in and out to locate specific locations. On Google Maps, the average data loaded from the cellular network for each step was 1.3MB. Apple Maps came in at 271KB – that’s approximately 80% less data! On some actions, such as zooming in to see a particular intersection, Apple Maps’ efficiency advantage edged close to 7X. Why the difference? Mostly because the Apple Maps app uses vector graphics that can resize infinitely without having to reload any new data. But if you’re on a limited data plan and need to use this application a lot, we suppose that it’s some kind of silver lining. While I do like vector graphics. It’s also obvious you are getting a lot less information of what is around you. I hear vector graphics works better with HDTV images and videos. Since handheld devices are soon to become HDTVs, vector graphics, especially for people sketching on drawings, including maps is the way to go. Maybe it’s because THERE IS NO INFORMATION TO LOAD. My house is in a lake. Also, Apple maps being useless, you probably end up using much less data than what you would with a useful app. If one is permanently constrained by mobile data usage, one should consider a Nokia phone with offline navigation.